MORE THAN 300 TYPES OF CHEESE PERSONALLY SELECTED BY OUR CHEESEMONGERS. 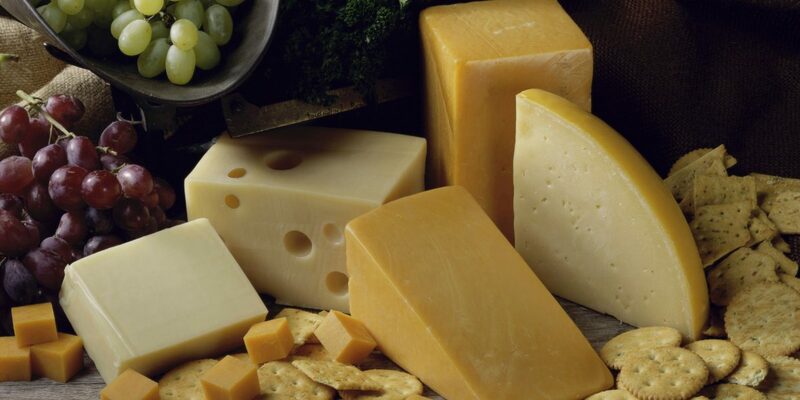 We carry the best cheeses from all over the world, which are hand-cut in store by our cheese specialists. Ask us for a taste! We also offer an expanded charcuterie selection with an emphasis on Italian specialties, as well as pâtés and terrines, caviar and smoked fish. Our department also has a wide variety of crackers, honeys, candied fruits and nuts, preserves, and salts to pair with your favorite selections. Our cheese selection is constantly changing, so there’s something new to discover on every grocery run. We asked our cheesemonger Scott to recommend some of his favorite selections right now. Scott is a Certified Cheese Professional and member of the American Cheese Society. Made in the Emilia Romagna region of Italy using the same traditional methods that have been around for centuries, this flavorful, pure cow’s milk cheese – Italy’s most famous – is aged for at least 12 months. Parmigiano-Reggiano has been recognized by the European Union as a DOP (Protected Denomination of Origin) product. The dedicated farmers of the Latteria Soresina cooperative, where we get our cheese, have been making Parmigiano-Reggiano for generations. brie that tastes like fresh butter. Pair it with fig spread and Spanish Marcona almonds and you’ll wonder why you haven’t been eating this every day. This Spanish goat cheese is soaked in Tempranillo grape must for 72 hours. You’d better believe it tastes awesome! This Italian unpasteurized cow’s milk cheese comes from the Val d’Aosta region of Italy. It’s a washed rind, with a fantastic tangy taste and smooth texture. My favorite cheese in the world (this week). 700 years of history can’t be wrong! This nutty, cave-aged alpine cheese is a favorite for mac-and-cheese. Other mac-and-cheese options are creamy, crunchy Excalibur 1- Year Cheddar, New Bridge Mild Cheddar, Parmigiano-Reggiano, and Karst, a funky, cave-aged blend of Cheddar and Gruyere. Smooth, Creamy, Grassy and delicious. This fresh goat chevre is tangy and citrusy. It pairs well with Reds,Whites, and everything in between. The pride of Spain, this sheep’s-milk cheese is made in the La Mancha region. It’s grassy, herby and welcome on any cheese plate. Often overlooked, but never forgotten. My kids won’t let me leave the store without buying them a piece of this Swiss-style Dutch cheese. This is a young gouda – its only aged for 6 months. Its a Butter bomb! !Soft, smooth, and slightly sweet, try serving it with fruit paste. The ideal temperature range for storing most cheese is between 35 and 45 degrees, preferably in the bottom vegetable bin of your refrigerator. Wrap cheeses separately, especially pungent blues, washed rinds and milder cheeses, since they will pick up each other’s smells and flavors. Harder format cheeses like Excalibur (an English aged cheddar), Rembrandt (a Dutch aged gouda) and Parmigiano-Reggiano (a hard, mature granular-style) can be stored at room temperature until they are cut. These harder format cheeses are perfect for picnic baskets because they can withstand warmer temperatures. Pulling a cheese plate together is easy if you follow a few basic rules. Tell your Rouses cheesemonger how many people you’re expecting and how many choices you want to offer. It’s always better to go for quality over quantity, and choose a variety of textures and flavors. PLATING Make the plate at least one hour before the party. Cheese is always best served at room temperature. Separate strong-smelling cheeses, like Gorgonzola and Stilton. Label each cheese, and set out a separate knife for each cheese. Offer a selection of breads and crackers, preserves, honey, and chutneys, seasonal and dried fruits, and nuts. TASTING You always want to start with milder cheese and work your way up to the blues, and you may choose to work your way from soft to hard cheese. PAIRING Pairing wine and cheese? There are no “rules” here; it’s all about what you like. Charcuterie (prounounced shar-kood-eree) is a common antipasti in Italy. When building your charcuterie plate, use a mixture of cooked and dry-cured meats and cheeses. Provide something briny and tangy like pickled vegetables, olives or peperoncini, which pair well with bold meats. Add spreadable chutneys, candied fruit, fresh fruit or sweet jams to balance the dry and salty meat and cheese. Include softer options like pâté, terrines and rillettes (shredded, cooked pork mixed with pork fat) as counterpoints to harder sausages, and mustard as an accompaniment. Serve with crusty bread, crackers, crostini or breadsticks. Mix and match as many as a dozen olives and Mediterranean specialties.